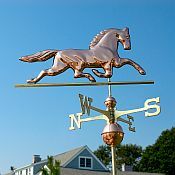 Add a touch of charm to your home, shed, garden, or deck with a beautiful, classic-looking Weathervane. We offer standard-size weathervanes and garden weathervanes in a variety of appealing designs and finishes. Our garden weathervanes are a smaller version of the larger, standard-size weathervanes. These charming home embellishments are designed by American craftsman and are handcrafted with great detail. The figures, directionals, and spacer balls are made of durable copper and brass to ensure years of enjoyment. They add a touch of elegance to any home, barn, or garden gazebo.